This guide talks about NTFS partition recovery and shows how to recover formatted NTFS partition and perform lost NTFS partition recovery with the help of partition recovery software in Windows 10/8/7/XP. Want to recover from NTFS partition? Finish reading this guide, and you’ll be able to effectively deal with partition recovery issue. Fortunately, NTFS data recovery is available in most cases and it is quite easy to restore all data from NTFS drive as long as lost files or partitions are not overwritten. NTFS partition recovery software is designed to retrieve lost data from NTFS drives as well as restore deleted partitions or restore partition table. We’ve learned that deleted data is recoverable before it gets overwritten, which is also true of deleted partition. Thus, you should make sure there is not any writing action to the disk once data loss issue appears. Lost partition recovery: partition may get lost due to various causes such as deletion, disk partitioning, system restore, partition table corruption. 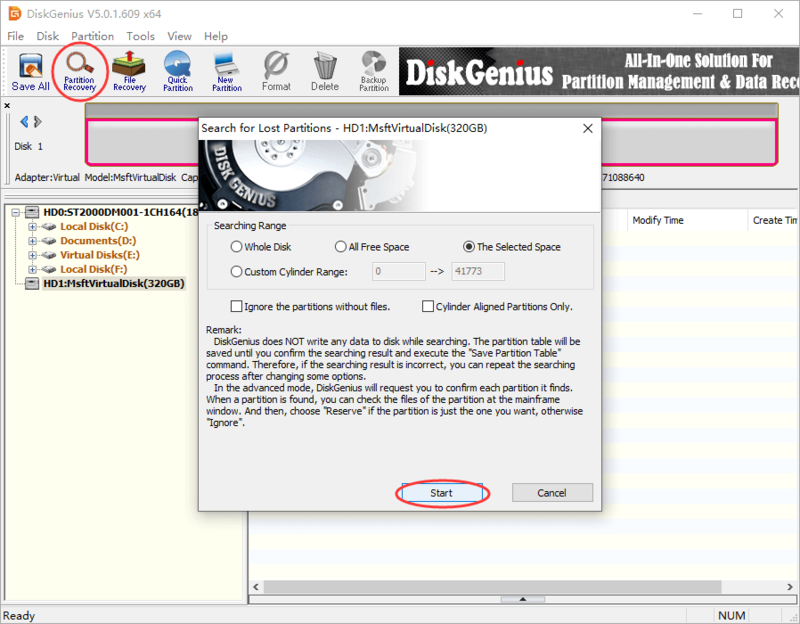 DiskGenius can search for lost volumes together with files in the partition so that they can be restored directly. Recover formatted/RAW partition: Recover files and folders from partition which is formatted, accessible, corrupted, RAW or unformatted. In some cases, RAW drive recovery by using the function Load Partition Intelligently. 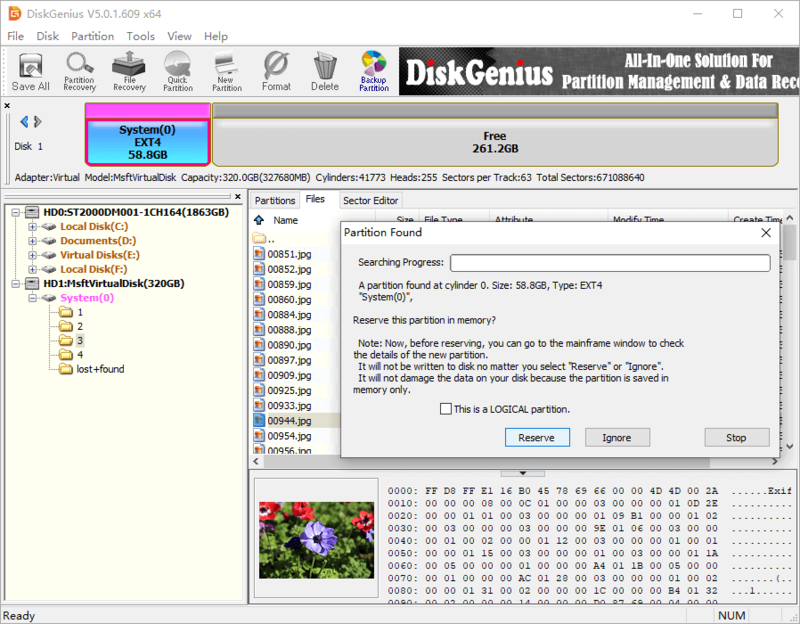 Recover deleted files: DiskGenius enables you to recover deleted files from partition or recover lost data from deleted partition. EXT4 partition recovery: restore lost ext4/3/2 Linux partition or retrieve deleted/formatted files from EXT4 drives. Supported device: hard drive, external HDD, SSD, USB flash drive, SD card, pen drive, virtual disk, RAID, memory card, etc. In this example, we’ll show you how to recover lost files from formatted NTFS partition using DiskGenius. This guide can also be used to retrieve data from corrupted, RAW or unformatted drives. One thing should be noted that the partition to be recovered should not be written any data before all files are successfully recovered. Step 1: Install and launch DiskGenius from your computer. Then you can view the NTFS partition where lost files were stored. If your computer cannot boot to Windows, you can perform partition recover with DiskGenisu WinPE Edition. This application supports create WinPE-based bootable USB disk with which you can boot computer to DiskGenius WinPE edition. Step 2: Right-click on the NTFS partition from which you want to recover data and choose “Recover Lost Files” option. This opens Recover Files window. 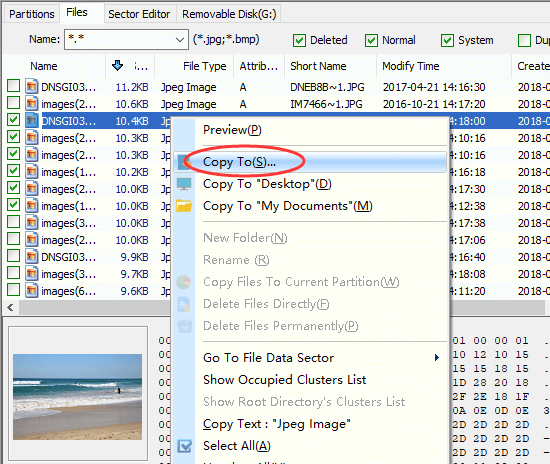 Step 3: Select Complete Recovery and Search For Known File Type, and click Start button. The DiskGenius starts to search for lost files from the partition. Step 4: Preview and recover data. Once your files are listed, you can preview files to find out want you need and then copy them to a different partition. Hard drives or external hard drive might be divided into several partitions so that files can be stored in separated sections. Likewise files, partitions on the disk can also get lost, for example, you may delete a volume by mistake, a disk get repartitioned, partition table gets corrupted, etc. In this case, you may need to recover data from deleted partition, restore partition table or get back lost partitions. Now, we’ll show you how to recover lost or deleted partitions and restore them to partition table. Step 1: Connect the disk from which you want to recover lost NTFS partitions, and launch DiskGenius. If partitions on the disk have been deleted, you can see unallocated disk space in DiskGenius. If you repartitioned the disk, then current partitions are displayed in the software. Step 2: Select the disk or unallocated disk space in DiskGenius and click Partition Recovery button. This open partition recovery window. Step 3: Set searching range and click Start button. Then DiskGenius starts to look for lost partitions. During scanning, you need to choose Reserve button when DiskGenius finds out a partition you want to restore; otherwise click Ignore. 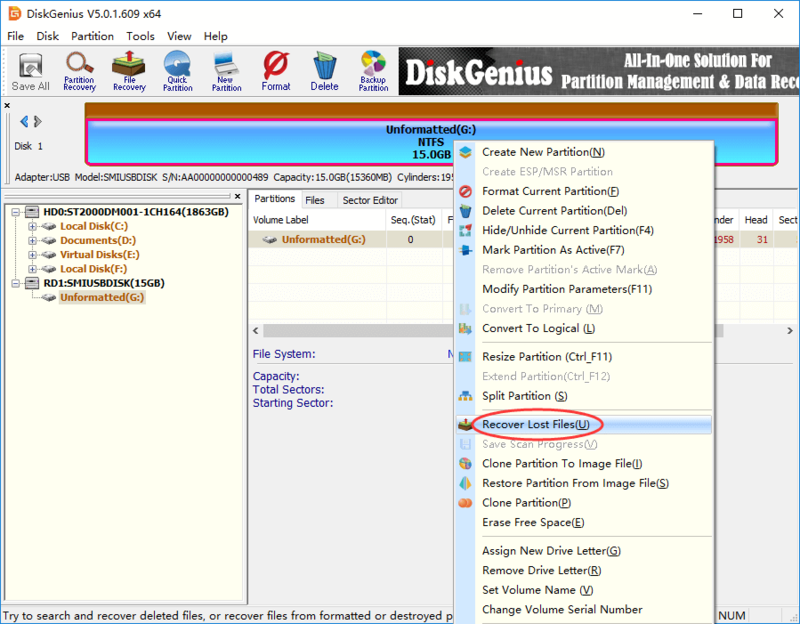 Step 4: Save lost partition to partition table by clicking Save All button. Video tutorial on lost partition recovery: How to Recover Deleted Or Lost EXT4 & NTFS Partitions? We’ve shown you how to do NTFS partition recovery, including recover lost files from formatted NTFS drive and restore lost NTFS volumes. 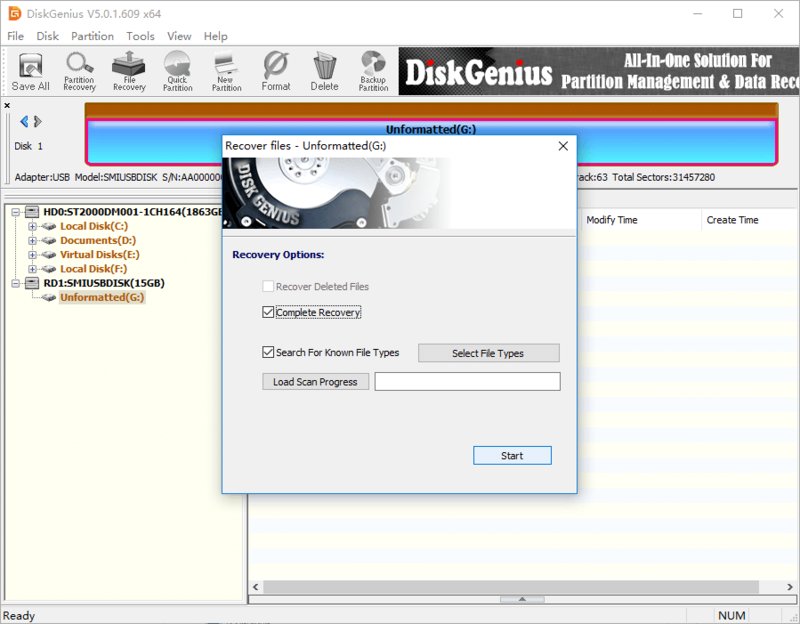 You can easily get back lost data from damaged, formatted or lost NTFS partitions with the help of DiskGenius. Apart from data recovery, DiskGenius can also help you resize partition, extend C drive, format partition, check bad sectors, etc. Should you need any help regarding NTFS partition recovery, please feel free to contact us. This entry was posted in Partition recovery and tagged lost partition recovery, NTFS partition recovery, partition recovery software, recover formatted partition by EASSOS. Bookmark the permalink.